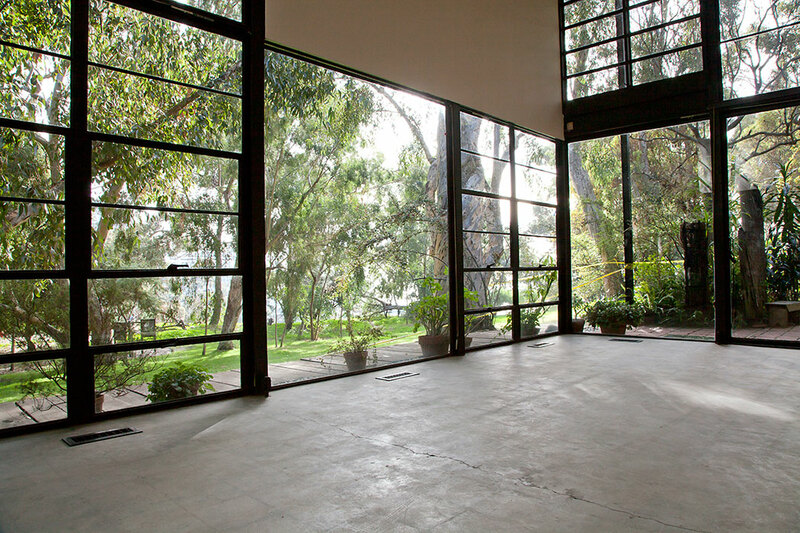 The Eames Foundation, which is responsible for the house, is intent on providing a long-term sustainable approach to the care of the site, buildings, and collections in their care. The Eames House Conservation Project aims to demonstrate the applicability of established conservation approaches to cultural heritage sites of the modern era. 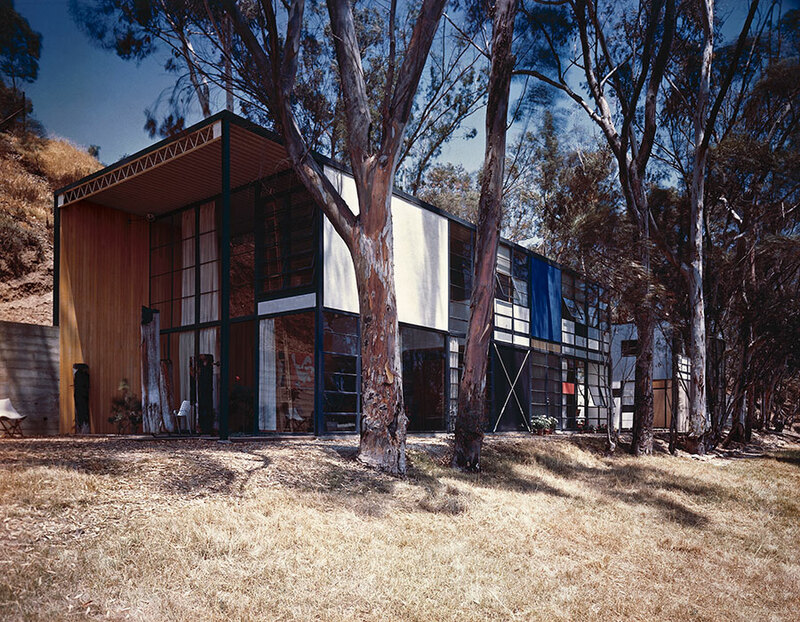 The Eames House was constructed as Case Study House No. 8, under Arts and Architecture magazine's influential Case Study House program. Initiated by John Entenza, the publication's editor, the program was devised to promote the design and construction of innovative, low-cost, prototypical modern houses that would serve the needs of postwar families. Set on a bluff above Pacific Coast Highway, Case Study House No. 8 consists of two structures, a living space and a working space, connected by an open courtyard. The house and studio, which are nestled between a hillside and a row of stately eucalyptus trees, enjoy views across a wide meadow to the ocean beyond. The standard, light, factory steel framing forms a delicate web, which is filled with a variety of materials—transparent and translucent glass, and opaque panels, some brightly painted and others a soft gray. The house is filled with a diverse array of furnishings and objects that Ray and Charles Eames collected throughout their lives. Toys, folk art, brightly colored textiles, seashells, and stones sit comfortably alongside antiques, abstract expressionist paintings, and Eames-designed furnishings. The house and studio, including the living room and kitchen interior furnishings, appear today much as they upon Ray Eames's death in 1988. The site, house, studio, and interior collections tell a remarkable story about the architecture of this period, including the role of California modernism within an international context, and provide an intimate view into the life of its occupants, opening a new understanding about the human side of modernism. 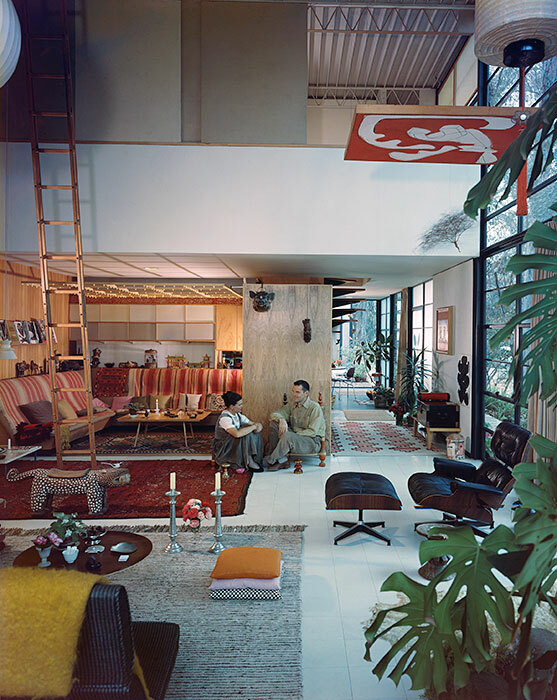 From September 2011 to June 2012, the contents of the Eames House living room were temporarily relocated to the Los Angeles County Museum of Art (LACMA) for exhibit. . This provided the Eames Foundation with the impetus to address various issues relating to the general wear and tear on the house since its construction in 1949 and catalyzed the foundation's partnership with the Getty Conservation Institute. View of the living room steel frame window wall as it appeared in 2011, when the room's contents were on exhibit at LACMA. The deteriorated floor tiles have been removed, revealing the original concrete floor. Photo: Holly Brobst.